This All Star Series trophy stands tall at 6.25”. Featuring pompoms and a megaphone, surrounded by gold colored stars, this trophy clearly celebrates a love of cheer, and is perfect for cheerleaders and cheer teams of all ages. Choose this trophy to celebrate team success and commemorate a season to remember, or take a look at our 4.25” version of the same award. 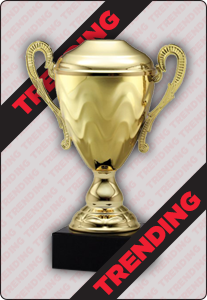 Make this trophy extra special with an engraved message.